Inbound Inventory Adjustments are used to place items into your inventory without having to create a Purchase Order. Inbound Inventory Adjustments are often used to bring initial inventory into your TeleTracker Online database. To access Inventory Adjustments from the menu bar of the main TeleTracker Online screen, click Transactions > Inventory Adjustments. To create a new Inventory Adjustment, click on the New button located on the toolbar. To open an existing Inventory Adjustment, select the Transaction from the Inventory Adjustment list and click the Open button. IMPORTANT: When creating an Inbound Inventory Adjustment, you must be logged into the location that the product(s) will be adjusted IN to!!! (1) Select the appropriate Direction for the Inventory Adjustment. Select IN to place inventory into a BIN. (2) Select the appropriate BIN in which you will be working with. When creating an Inventory Adjustment IN, select the BIN in which the inventory will be place into. 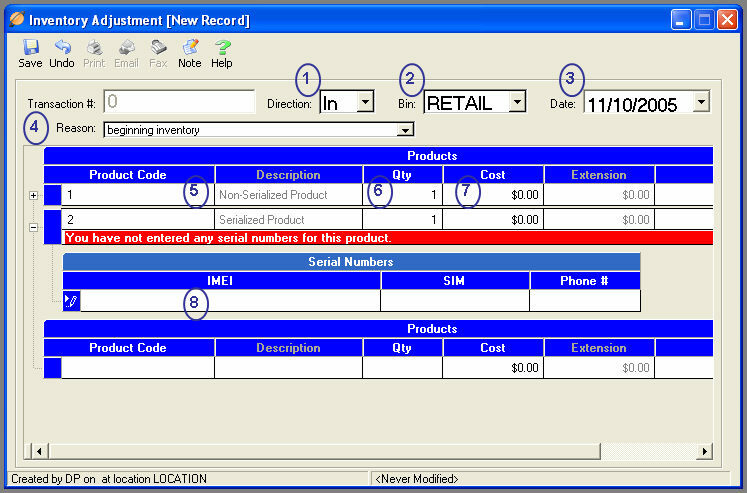 (5) Place a product onto the Inventory Adjustment by entering the product code into the Product Code field. Enter the Product Code by scanning the product barcode with a hand held scanner, typing the code manually, or performing a lookup and choosing from existing products. To perform a lookup, click on the lookup button in the right corner of the Product Code field. (6) When adjusting serialized products, a sub-menu will appear prompting you to enter the product’s serial numbers. You may enter serial numbers either by scanning the barcode with a hand held scanner or by manually entering the values. The Inventory Adjustment cannot be saved unless all serial numbers are entered. (7) Enter the Qty (quantity) of the product being placed on the Inventory Adjustment. TeleTracker Online will automatically default the quantity field to one (1). You may change the quantity by either using the scrollbar on the right-hand side of the Qty field or entering the desired quantity. (8) TeleTracker Online automatically populates the Unit Cost field with the last cost placed on an adjustment for the respective product. You may edit the cost of the product being adjusted into inventory by clicking into the Unit Cost field and entering the desired cost. With the proper security level, you may return to an existing Inventory Adjustment and modify the Unit Cost field. This modification will filter down to all of the transactions and update the cost of the product.